The Wahler Place Campus Redevelopment Project was a two-year project that redeveloped the original Achievement Prep campus on Wahler Place. This included the construction of a new building and the renovation of the existing building. 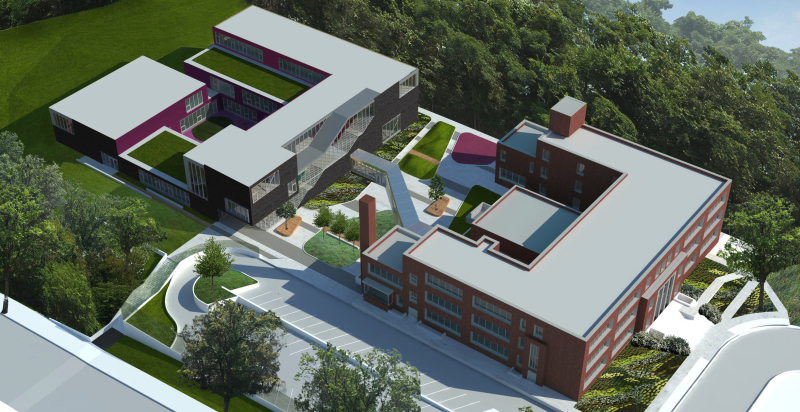 Through these developments, we moved our flagship Wahler Place Middle School into the new building and relocated our Mississippi Avenue Elementary School to the original building on Wahler Place. Phase I: The first phase of the Wahler Place Campus Redevelopment Project included the construction of a new middle school building on our Wahler Place lot behind the existing middle school building, as well as site improvements, including a new parking lot and landscaping. Phase I work completed December 2015. Phase II: The second phase of the project included the renovation of the original building to host our elementary school. This phase began in January 2016, upon completion of new middle school. The renovation of the original building was completed in January 2016, in preparation for the 2016–17 school year. 4) Offer families PreK through eighth grade options in one location. At Achievement Prep, we believe that we are community partners who can create and impact change for all of the children in the communities that we serve. We also believe that if we have the opportunity to educate students, regardless of zip code or background, we can close the achievement gap and create an immediate academic impact. The Wahler Place Campus Redevelopment Project created additional high quality seats in Ward 8, allowing us to better serve the community that has welcomed us since we opened our doors in 2008. In 2016, upon completion of the Wahler Place Campus Redevelopment Project, we offer a high quality PreK option for our families through a partnership with a highly regarded early childhood charter operator, Appletree Early Learning Charter School. In 2016, we offered 960 high quality seats to scholars from ages 4 to 14 in one location East of the Anacostia River.